This post has been brought to you by www.livefreefun.ca The Best Camera Review Site. The government of Vladimir Putin has said that he is closely following the movements of the ship ‘ Donald Cook ‘, who is carrying out military exercises in the Black Sea. US Destructor “Donald Cook” is in the port of Batumi, Georgia , to participate in joint exercises with the navies of both countries, the Coast Guard reported the Caucasian country. “The US vessel will remain in the territorial waters of Georgia until January 25 (this Friday) and will participate in joint exercises with members of the Coast Guard (Georgian),” the agency said in a statement. Russia reported on Sunday that it followed closely all movements of the US destroyer after its entry into the Black Sea, near its coast and the scene of a famous naval incident between Russian and Ukrainian forces last November. 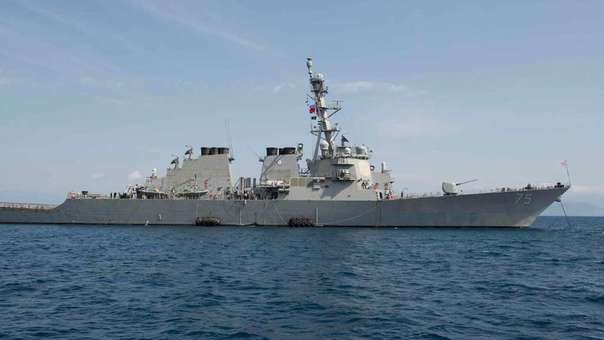 “The forces of the Black Sea Fleet proceeded to follow the American destroyer ‘Donald Cook’ equipped with missiles from the US Navy just after his incursion into the waters of the Black Sea,” said the National Defense Control Center. Russia in a statement. For its part, the US Navy recalled that it routinely patrol the Black Sea in strict accordance with international laws and that it continues to support its allies in the defense of regional interests and maritime stability. The commander of the “Donald Cook” , Matthew J.Powel, stressed that such cooperation will allow to react effectively to future crises and contain possible aggressions. According to sources from the US embassy in Tbilisi , 306 crew members are on board the destroyer that entered Batumi. The arrival of “Donald Cook” to Georgia “reaffirms the commitment of the US and Georgia to stability and security in the region,” they said in the diplomatic legation. On November 25, three Ukrainian vessels were seized by Russian coastguards in the Black Sea for violating the territorial waters near the Crimean peninsula, after which Kiev accused Moscow of “aggression” and declared a state of emergency in ten regions of the country. country, mostly border with Russia or bathed by the Black and Azov seas. Ukraine accuses Russia of restricting maritime traffic to convert the Azov, inland sea shared by Russians and Ukrainians, into an area under Russian control, while Moscow says it simply wants to guarantee the safety of the Crimean bridge . Naval Intelligence Director: Navy Must Learn to Fight Through Cyber-Attacks.